With more than 800,000 asylum seeking refugees coming to Europe in 2015 only, the global refugee crisis has become one of the most sensitive and highly discussed topics of our time. The movement of undocumented migrants from various Middle East and African countries to the Mediterranean region that started in 2007 has now reached a critical point and evoked what is now called the European Refugee Crisis. The continent has proved itself not being politically, economically and culturally ready to deal with the influx of refugees who are seeking after humane living conditions and shelter from Syria, Afghanistan, Mali and other tense conflict areas. Dealing with the chaos of the sudden migration has been an ongoing concern and challenge of the European Union and other European countries. As a European youth initiative, “My Europe” must be receptive and objective to the problems and challenges that regard our continent. Therefore, we encourage YOU to actively participate in the upcoming Live Chat and express your insights on the subject with a man who has almost longlived experience and expertise on the matter Kilian Kleinschmidt. Mr. Kleinschmidt, the son of two teachers, grew up in Berlin, Germany. He did not become the “Good Samaritan” in an instant. Kilian Kleinschmidt started off as a carpenter and arguably found his calling for humanitarian work at the age of 26, after an aid worker invited him to help build a school near Timbuktu during Kleinschmidt’s motorbike trip to Mali. He has contributed his life and career to humanitarian purposes ever since.Mr. Kleinschmidt has been an active member of the United Nations and the United Nations High Commission for Refugees for 25 years during which he developed an impressive list of achievements as a humanitarian aid worker. In between his work in Uganda, Kenya and Bosnia, Kilian Kleinschmidt helped organize a camp for the so called ‘Lost Boys of Sudan’ who were displaced and orphaned during the Second Sudanese Civil War; has been a liaison and a coordination of UNHCR operations in the Great Lakes Region which has long been exhausted by civil war and conflict; coordinated one of the largest humanitarian airlifts in history for Rwandans caught in the rain forest in Congo to name only a few. All of his hard work, charisma and tireless persistence has earned him the nickname of a “Crisis Manager” in aid circles. 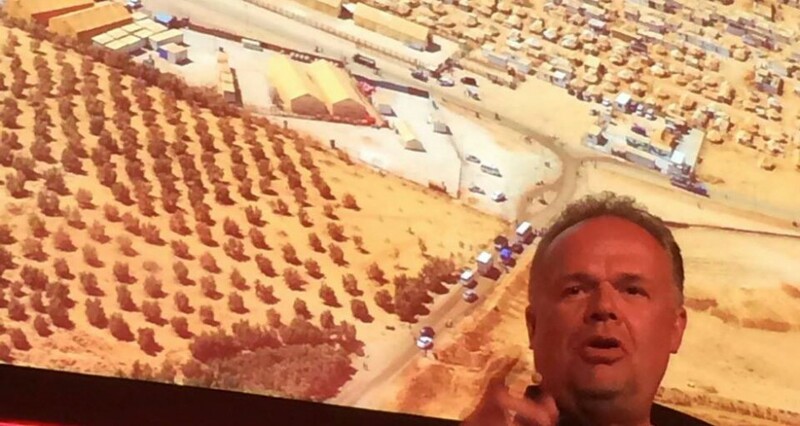 Maybe because of this binding title Kilian Kleinschmidt was offered another challenging position the Senior Field Coordinator or as he calls it “the International Mayor” of the second largest refugee camp of Za’atari in Jordan. Discussions emerged and Kilian Kleinschmidt along with his team of aid workers, invited professional urbanists from all over the world to develop something he called a “more organic and more peopledriven” plan of the camp that would successfully connect the space, culture and the services within the camp. The new approach allowed the Syrian refugees to individualise their settlement in Za’atari with marketlike shops, various business ideas, even shop in socalled “International Supermarkets” where they could receive their monthly food aid using vouchers and avoiding undignifying queues in the storage room. 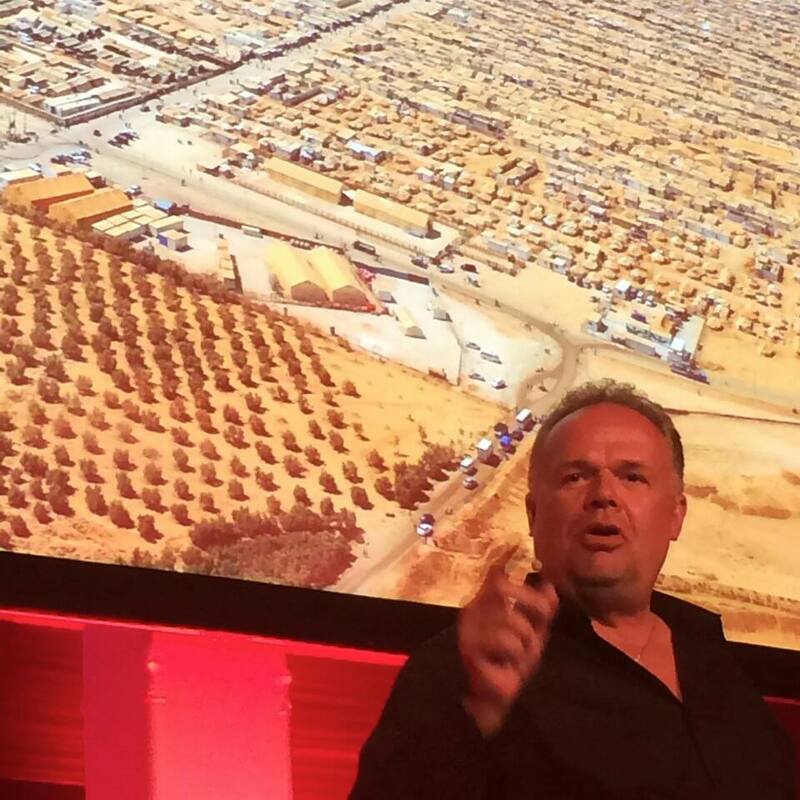 Kilian Kleinschmidt and his groundbreaking approach helped to start making Za’atari a city rather than a refugee camp. His position towards bringing the 21st century to the refugee camps were met with concern in the UN. Maybe that is why in the year of 2014 Mr. Kleinschmidt decided to leave the UNHCR and settle his own Innovation and Planning Agency in Vienna. His comment on the withdrawal from the UN work was that “I left the the UN to be as disruptive as possible, as provocative as possible, because within the UN of course there is certain discipline. I mean I was always the rebel. Humanitarian agencies cannot cope with the crisis. We’re doing humanitarian aid as we did 70 years ago after the Second World War. Nothing has changed” and according to Kilian Kleinschmidt our approach to the refugees MUST change. What can be made to make the change reality? Let’s elaborate on this and many other questions that concerns You during the Live Chat. We kindly invite you to participate and do not miss out on an exceptional opportunity to discuss the global and European refugee crisis with one of the greatest experts in the humanitarian field Kilian Kleinschmidt. Click HERE for direct link to the Live Chat!